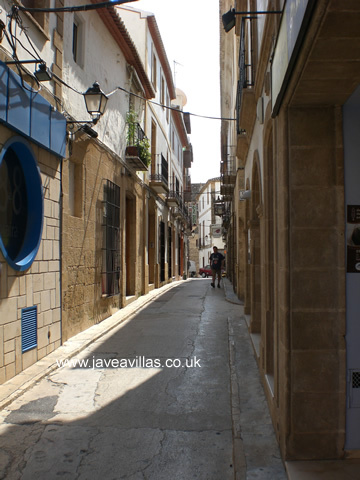 We do have one or two Javea villa rentals near the old town, such as Casa Paulina. 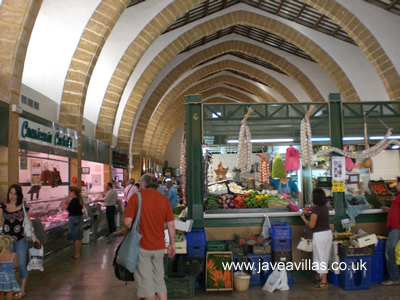 Javea's old town is where you will find the main Church, the Market, Post Office and the usual Restaurants and Bars. Although it seems very old, the main road that runs through it a dirt track 30 years ago! 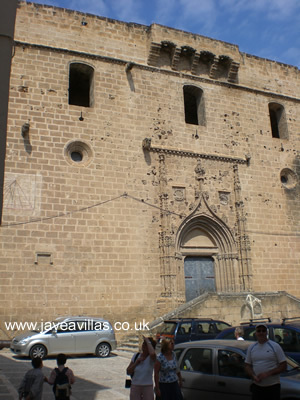 Before the advent of tourism Javea was a small sleepy town relying on the port for fishing and farming for local income. In fact, many of the 'fincas' that have been renovated (such as 5 bedroom Casa Vigo - a villa with lovely pool near the old Javea town centre) feature very wide nayas - therse are the covered exterior areas - and were originally used for drying the crops - such as grapes by hanging the fruit from poles that were slung across the nayas. 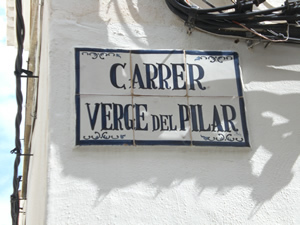 In the main "casco urbano" surrounding the Market and Church there are narrow "Moorish style" streets which cars cannot access but which are lined on both sides by shops of all kinds, art galleries and restaurants. 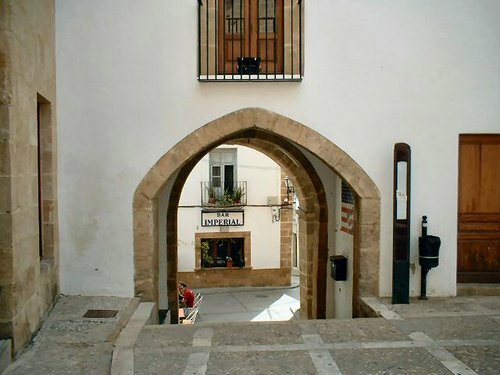 One of the best tapas bars in Javea is here, right in the middle of the old town near the covered market and church, Bar Imperial. You can see the bar just through the archway in the picture top right. 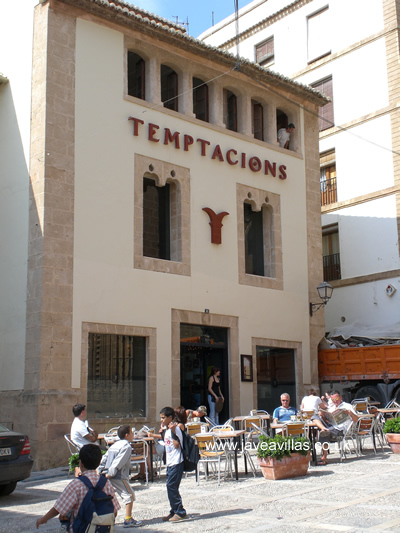 Opposite the church is another very nice bar - Temptacions. The tourist information office is just on the corner here also. Thanks to the streets being so narrow they avoid a lot of the heat of the day so a walk around here can be really pleasant. It's also worth checking out the indoor market which is located right next to the church - good for fruit, fish and cheese. 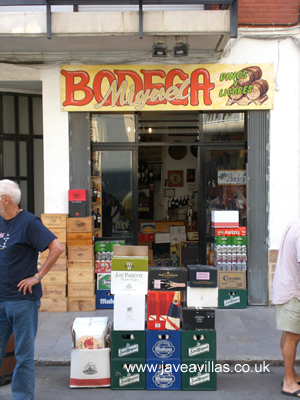 At the top of the town (you will drive up the hill as you come from the port) you will find the post-office and opposite it a really good bodega. try buying your wine here instead of at the supermarket. The shops up here are pretty good too. There is a good swimwear and lingerie shop Pepita Devesa and just down the hill a bit, on the right, there is a good shoe shop too. If you head back down the hill on foot towards the port you will come to a cool lady's boutique. Opposite this boutique is a bar which does decent tapas where I met Tony Robinson from Time Team. He is quite a fan of Javea. 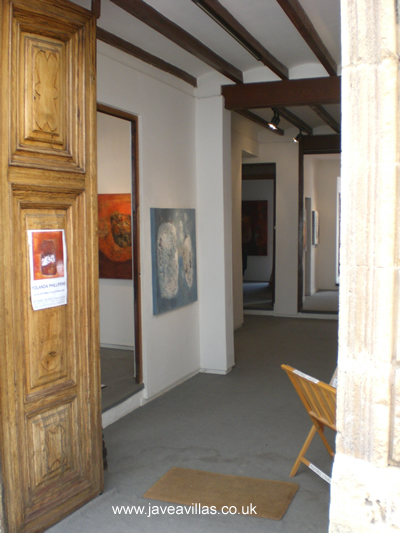 Moving into the old town you will find some nice bars and cafes here, and you will also find a really lovely art gallery - Isabel Bilbao (Virgen del Pilar 9, tel 96 5792272). They feature work by many local artists. I think my favourite is Oscar Bento who does some lovely seascapes that really capture the spirit of Javea. 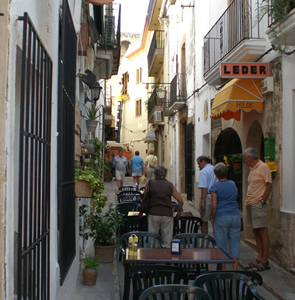 While you are wending your way through these narrow streets you will come across many bars that squeeze tables into the street.